Vegetables and fruits are complex carbohydrates that provide fiber and are packed with vitamins, minerals, and other important substances. Many nutrition experts suggest that you think of animal protein as a side dish to accompany vegetables and grains, rather than the other way around. In some societies, meat is actually used as a seasoning. Try including small amounts of chicken or beef in a vegetable stir-fry or in sauces for pasta dishes. You can easily get all the vegetable protein you need by combining proteins from several different vegetables in one meal. Dried beans, lentils, and lima beans are excellent sources of soluble fiber and protein. Nuts are another good protein source - snack on them or toss them on salads and vegetables - but remember they are high in fat. 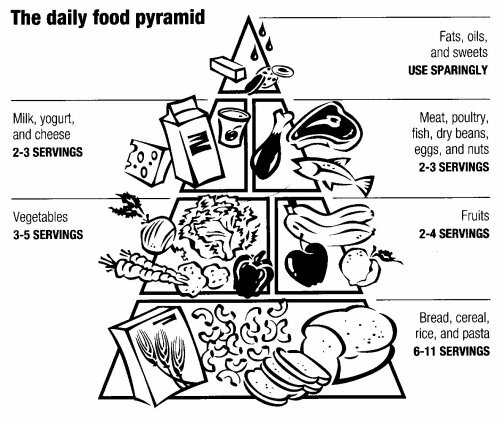 Fats, oils, and sweets make up the tip of the pyramid. One option for people with high cholesterols is to take either Benecol or Take Control margarines; using these in the doses recommended on the label may lower cholesterol by 10 to 30 points. If it is wrapped in plastic, you should probably limit you patronage! Avoid regular soda. I suggest drinking water or one of the fruit-flavored 0 calorie waters. Diet soda is another alternative, though I am not in favor of consuming large amounts of sugar subsitutes. Limit carbs in favor of higher protein foods (nuts, fish, vege-meats, beans [like red beans, black beans, chick peas, lentils, etc], as well as favoring fruits and vegetables (which do have carbs) over the more traditional grain-based carbs (like pasta, breads, crackers, muffins).